It is very common that two business partner initialized progress in a joint venture to complete a project, service or other tasks. To legalize all the proceeding of such ventures it is necessary to sign an agreement. This will save them from any future quarrel or legal pitfalls. Joint Venture Agreement document is used when you would like to involve in an operation where you collaborate with other individual or organization. In a joint venture agreement, you’ll define your business purposes and the contribution of each group. The responsibilities assigned to each group are also stated in the agreement along with the distribution of the potential profit and loss. A joint venture agreement is basically a partnership type agreement, defining a fixed period of time. After the end of the task, the joint venture is completed. The agreement should state the termination clause if the joint venture does not proceed successfully. Joint ventures are usually a form of profit-making alliance in which two or more completely different groups interchange, or assimilate their personal resources to gain profit on mutual basis while remaining free in their own perspective. Companies are also involved in joint ventures along with some shares of the general public but here the founding groups remain dominant. 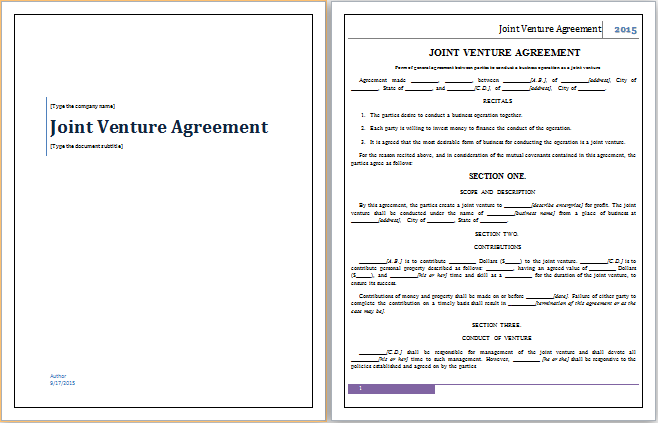 Various pre-formatted templates are available online to ensure joint venture agreement. You can opt for the customizable form to download and craft your own joint venture valid agreement.